The Peace Learning Center of Milwaukee, Inc. awarded Karen Swanson and Crystal Mello the Don Austin-Phyllis Berentsen Peacemaker of the Year Award at a celebration Wednesday, November 14. The award is named for Don Austin and Phyllis Berentsen, honoring their extraordinary work founding and developing the Peace Learning Center, which provides workshops that teach methods of nonviolent conflict resolution. Karen Swanson has been a facilitator (teacher), grant writer and all-around enthusiast for the PLC. She is presently a guidance counselor at Windlake Elementary School. Crystal Mello is a freshman at Riverside High School. She has been a peer mediator and peace activist since she attended the PLC workshops when she was a fourth grade student at Gaenslen Elementary School. Crystal is continuing her peacemaking activities with the Activist Club at Riverside. 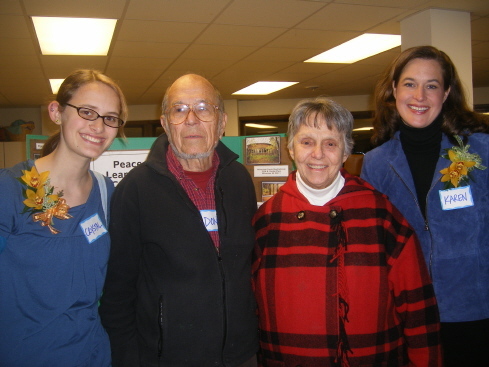 Organized in November 2001, the Peace Learning Center of Milwaukee, Inc. sponsors a Peacemakers’ Workshop program. It began as a pilot project involving 105 fourth and fifth grade students from one school in 2002-03. Since that time, it has expanded to a program that has involved over 2500 students from 17 schools. The Peacemakers’ Workshop program is held in the Friends Meeting house, located on the west bank of the Milwaukee River. Fourth grade students and their teachers participate in a five-hour workshop that engages both students and teachers in activities focused on developing non-violent conflict resolution skills. Activities include cooperative games, relaxation techniques, learning safe ways to deescalate confrontation, methods of conflict resolution, learning about Peace Mentors, and outdoor environmental education. In-class visits two weeks after the workshop experience reinforce the skills learned and the use of the methods in the classroom. For more information about the Peace Learning Center, contact: Nancy Theoharis, Chair, at 414-352-2015; or Kim Apfelbach, Adminstrator 414-350-4721.